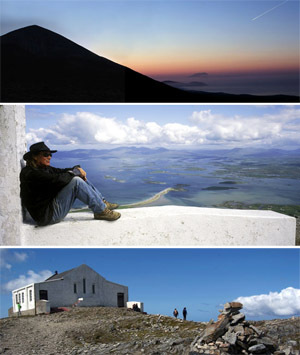 The Clew Bay area is well known as a highlight for hill walking and trekking. The ascent of Croagh Patrick is a ‘must do at least once in life’ for anybody. The views are breathtaking over the islands in Clew Bay. The ‘holy mountain’ is 764 m (2,507 ft) high from sea level and takes approx. 2-3 hours to climb at a relaxed pace and is challenging. It is the third highest mountain in County Mayo after Mweelrea and Nephin. On “Reek Sunday”, the last Sunday in July every year, over 15,000 pilgrims climb it. Croagh Patrick can also be climbed in Winter by the more adventurous with proper clothing and mountain boots. There are many spectacular walks around the wider Clew Bay area such as the Mweelree Mountains, Sheffry Hills and Killery Harbour, Achill Island on the North side of the Bay and Clare Island and Inishturk Island in the Bay have rewarding walks. For information on walking trails in the area see the website www.mountainviews.ie which gives maps and detailed descriptions as well as comments from hill walkers.